The Ray Wijewardene Charitable Trust (RWCT) in collaboration with the Sri Lanka Inventor’s Commission (SLIC) presented the ‘The Ray’ Award for Innovation for the second time on August 24, 2015. ‘The Ray’ is a life-time honour awarded once every three years in memory of the late Dr. Ray Wijewardene, the foremost inventor produced by Sri Lanka to help a recognised inventor to commercialise his or her invention. It is an award presented to encourage ongoing innovation and enterprise in areas of public interest and continue Ray Wijewardene’s vision of innovation among Sri Lankans. The nominees for the ‘The Ray’ award 2015 were recognised for their masterpieces of various uses. A cold air retainer door screening system, world’s first radius metre, smart controller for ceiling fans and artificial prosthesis for the disabled were the nominated inventions by Wing Commander P.L.L.C.S. Alwis, Dinesh Katugampola, Professor K. K. Y. W. Perera and Aruna Samarawickrama respectively. The nominees are selected by an expert panel of judges and the winner is entitled to a trophy and a citation from the RWCT. As a means of commercialising and further developing the invention the winner is also awarded with a cash prize of Rs. 1 million by the Commercial Bank. 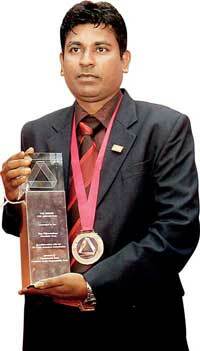 Aruna Samarawickrama, the inventor of the artificial prosthesis for the disabled, walked away with the coveted ‘Ray’ Award 2015 and in his comments Aruna said that he would develop the invention for commercialisation purposes and help those in need.